The fiftieth anniversary of Algeria’s war of Independence is less than a year away. This war, that became the model of Third Worldism, is still being lived in Algeria, not only through official discourse (with the FLN continuing to assert its legitimacy based on its struggle against the French), but also through the urban spaces of Algiers itself. From Place Abdelkader to Rue Franz Fanon and the Place des Martyrs, one wanders along spaces that are revolutionary in name. Yet these streets are also hollowed out, haunted by a decade of civil war and the economic and social crises that have marked the past five decades. It is this sense of contradiction that provides the historical and psychological backdrop for Rachid Boudjedra’s latest novel, The Figs of Barbary, in which two distant cousins, Rachid and Omar, find themselves on a one hour flight from Alger to Constantine. In this hour, Rachid relives the intimacies, frustrations, and traumas of Algeria’s past, telling Algeria’s story through the vernacular of personal crisis rather than historical narrative. His memories are not structured by statistics or socialism, but expressed through the tangible moments of his youth and his experiences with sexuality, religion, and language. Yet each personal conjuncture comes up against a blockage, reflecting the belief that “All revolutions result in failure, but one has to accomplish them nevertheless." What emerges is a revolutionary surrealism that, at times, borders on the absurd. For example, the two cousins are fascinated by the personal accounts of colonial genocide. Yet Rachid is struck not only the cruelty and inhumanity of the French, but also the juxtaposition of quotidian kindness and historical barbarism. Thus the letters of Saint Arnaud call for the extinction of the Arabs, but also inquire about the health of his cat and news of his niece. Rachid struggles with this, wondering if Arnaud was a fanatical killer or a concerned uncle. This question, like many in the book, is never answered - not because we are missing a piece of information, but because the questions themselves are unanswerable. Was Omar’s father a collaborator? Is Rachid’s love for Omar the real reason for their mutual celibacy? Was Algeria’s revolution a glorious moment of national birth or the original sin of a civil war yet to come? During the war of independence, the French guillotined 198 individuals who supported the FLN (National Liberation Front). While this fact has been preserved and cultivated in the Algerian nationalist memory, Boudjedra is interested in the stories that have dropped out of official narrative, such as the figure of Fernand Yveton, who was the only European to be guillotined by the French. Or the fact that Abane Ramdane, a nationalist hero, was assassinated in Morocco on the orders of colonel Boussouf, a member of the Comité de coordination et d’exécution (CCE). Or how the identity of Algerian Jews appeared increasingly paradoxical as the war gained in ideological momentum. If the violence of the French is unforgivable in the eyes of Rachid and Omar, so was the corruption and infighting that characterized the post-independence period. The narrator of the novel, Rachid, clearly holds the generation who conducted the war of independence responsible for the future failures of the Algerian state. He recounts a moment in July 1962 when he was declared to be a French agent because of his blond hair and light skin, and was almost lynched by a crowd of people in the Casbah as a result. Eventually an old woman confronts the chief who has called for Rachid’s death and asserts that Rachid was, in fact, Algerian, despite the color of his skin and hair (“que j’avais quelque chose d’algérien malgré le teint de ma peau et la couleur de mes cheveux”). The use of “despite” in this sentence divulges another axis of Algerian history that traversed the revolutionary war and returned in the 1990s: the link between the structuring of self and forms of social and political purification. The Fanonian dialectic between self and other was never a zero-sum game in Algeria, where the self was always fragmented along linguistic, ethnic, national and religious lines. In the novel, the generalized anxiety of who, exactly, constitutes the other is also played out though the sexual lives of Omar and Rashid, whose celibacy and incestuous fantasies are a major theme of the novel. From Rachid’s licentious relationship with his young step-mother, to the shared trysts between the cousins and a set of twins, to Rachid’s brother’s unconsummated homosexual relationship with a Jewish professor, there is a sense in which any consummation is rendered impossible by the obstacles of history. This is not only because, as Rachid notes, marriage was economically difficult, but also because the normal channels of desire were blocked, sublimated, perverted. Nor were these blockages liberated in the rupture with the French in 1962. For Rachid, the violence of the war of independence returns in the “infernal cadence” of the civil war. He recounts that the during October 1988, his phone calls to Omar were punctuated by an impotence (impuissance) that stemmed the impossibility of action, a pervasive loss of meaning, and, worst of all, a humiliation and hatred of the self. As Rachid’s memories bring us to the civil war (which killed between 150,000 and 200,000 people), he is literally sickened by the perversion of his struggle against the colonial state. Surrounded by distorted and treacherous versions of revolutionary rhetoric, he concludes that some individuals were compromised by the logics of history while others succumbed to their own personal weaknesses. The exception to these figures is Omar’s grandfather, an old nationalist who Rachid describes as fierce and proud like the figs of Barbary. The parallels between Algerian history and this the characteristics of this plant are not difficult to ascertain; as botanists have noted, the desert is “a place for internecine warfare” so that “it is a marked characteristic of the cactus tribe to be very tenacious of life, and when hacked to pieces, to spring afresh in full vigor from every scrap or fragment.” In the novel, the plant not only serves to camouflage the Algerian fighters and symbolizes those who protected the country, but is also a racist term used against Algerians living in France (the French called the Algerians “figuiers” during the war). Thus, quite literally, the plant represents the ways in which those living in the worst of conditions can bear fruit. Like the streets of Algiers, the Figs of Barbary reflects the hope that the generations who faced colonial jails, life in the maquis, economic privatization, and civil war can sustain a national pride - even when the basic tenants of this nationalism have been distorted and compromised. 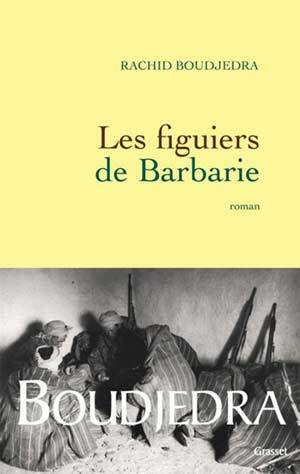 Les Figuiers de Barbarie by Rachid Boudjedra. Grasset, April 2010. All translations by Muriam Haleh Davis.